WikiSeek is a search engine that has indexed only Wikipedia sites, plus sites that are linked to from Wikipedia. It serves two purposes. First, it is a much better Wikipedia search engine than the one on Wikipedia (and has been built with Wikipedia’s assistance and permission). Second, the fact that it also indexes sites that are linked to from Wikipedia means that, presumably, it will return only very high quality results and very little spam. It won’t show every relevant result to a query, but it will certainly give a good overview of a subject without all the mess. The search results also include a tag cloud which contains Wikipedia categories containing the search term. Results can be quickly filtered by clicking on one of those categories (see screen shot, click for larger view). The first three results of a query are always Wikipedia content (unless there are not three results) and are shaded blue. The remaining results are below the shaded area. 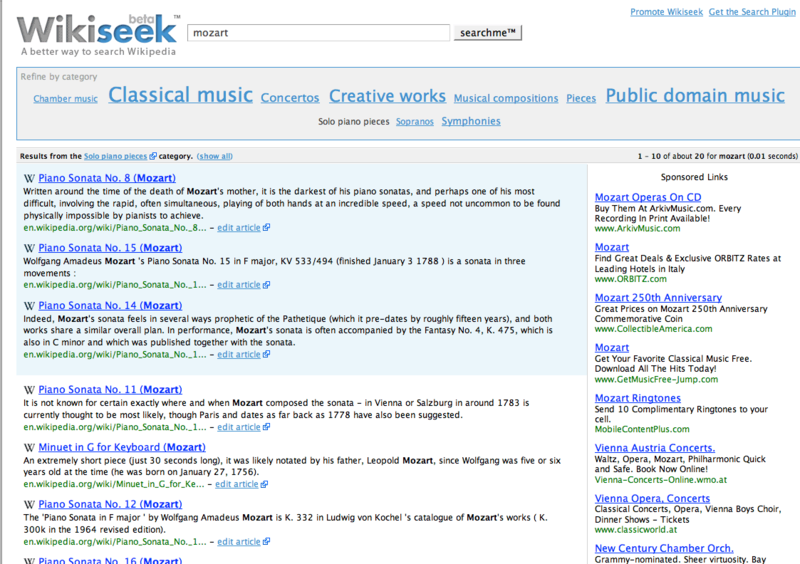 In addition to the search engine, WikiSeek has two additional tools – a search plugin for FireFox, IE7 and Opera, and a really useful greasemonkey-like Firefox extension that will change the way Wikipedia looks on that browser by adding a “WikiSearch” button to the search box (see screen shot below). 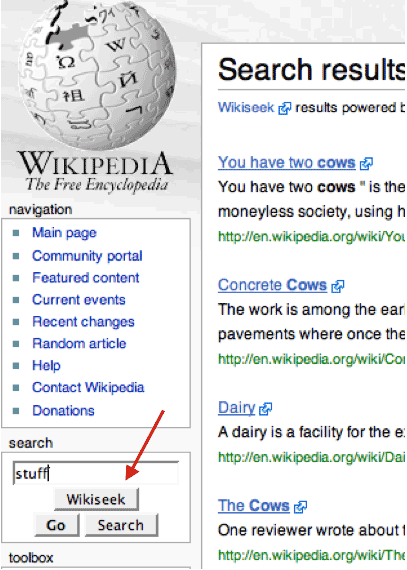 Click that button and see WikiSeek’s Wikipedia-only results. It’s faster and better than the results Wikipedia returns through its native search feature. SearchMe is donating “the majority” of revenue generated from advertising on WikiSeek to the Wikimedia Foundation. Adams told me earlier this evening that WikiSearch is a showcase product for their technology, and they are happy to help the Wikipedia community as much as possible by donating those revenues. WikiSeek will undoubtedly be confused with the much discussed Wikiasari search engine that was announced by Wikipedia founder Jimmy Wales last month. In fact, in our original post on Wikiasari, we included a screenshot that we later learned was not a prototype of Wikiasari. We corrected that post, and asked “the Wikisearch Screenshot Isn’t Wikiasari, So What Is It?” It was actually an early WikiSeek prototype, then called WikiSearch. Question answered.